Ibanez bass guitar cases are ideal for players who want to transport their precious gear safely with road-tough protection, but also require a lighter case. 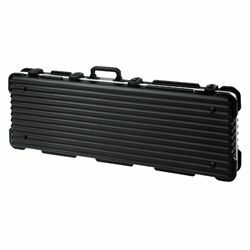 The rugged shell of the Ibanez MRB500C Road tour case protects your guitar from dents, scratches, dust and water. Inside, MRB500C features a special mold design for accommodating many electric bass guitars and left-handed models. Moreover, the MRB500C Road tour case can even fit 4-string, 5-string and even 6-string models. The MR500C comes with its own Ibanez tool case and can be securely locked up while flying or traveling with it TSA-approved lock.